Note: For ADHD in children with anger and behavioural problems, use Focus Formula together with BrightSpark Homeopathic formula. What is Focus ADHD Formula? What does Focus Formula contain? How long does a bottle of Focus Formula Last? For many people, this is what it's like to have Attention Deficit Hyperactivity Disorder, or ADHD. They may be unable to sit still, plan ahead, finish tasks, or be fully aware of what's going on around them. To their family, classmates or co-workers, they seem to exist in a whirlwind of disorganized or frenzied activity. Unexpectedly--on some days and in some situations--they seem fine, often leading others to think the person with ADHD can actually control these behaviours. As a result, the disorder can mar the person's relationships with others in addition to disrupting their daily life, consuming energy, and diminishing self-esteem. ADHD, once called hyperkinesis or minimal brain dysfunction, is very common and affects 3 to 5 percent of all children. Two to three times more boys than girls are affected. On the average, at least one child in every classroom needs help for ADHD. ADHD often continues into adolescence and adulthood, and can cause a lifetime of frustrated dreams and emotional pain. Rather than prescribing strong and sometimes addictive psychiatric drugs, naturopathic approaches to the treatment of ADHD and ADD take a more holistic look at the individual and take into account diet, lifestyle, personality type, surroundings and emotional factors. Natural remedies are used to effectively treat the symptoms, while at the same time helping the person to heal and to reach a state of balance and health. The natural approach is less harmful and more thorough and has a greater chance of curing the problem altogether, instead of keeping the individual on psychiatric drugs for many years. This is very important, especially in the case of children, because of the frequent side effects of prescription drugs and the risk of addiction. Too often, doctors and psychiatrists quickly prescribe powerful psychiatric drugs such as Ritalin, Concerta and Adderall to treat the symptoms of ADHD, subjecting ADHD sufferers to unnecessary risk and possibly devastating side effects. Focus is a proven, complex herbal remedy, especially formulated by a practising Clinical Psychologist to safely and effectively treat the symptoms of ADHD. In combination with a healthy lifestyle and diet which excludes excess sugar, stimulants, artificial preservatives and colorants, Focus acts as a calmative remedy which can focus the mind and improve concentration. "We love Focus. It has helped our son's ADHD just enough to help him in school, and yet still allows him to be himself instead of the zombie side effects from the pills. Thank you." "I just wanted to say THANK YOU SO MUCH for making FOCUS. My 5 year old son was having trouble in Kindergarden and the teachers and doctor's just gave me a perscription for Ritalin. They didn't even check him. They kept pressuring me about putting him on something and My Husband and I did not want to put him on medication for something we didn't know if he even had. No one checked him or even talked to him. So, I finally looked up natural ways to help since, My Husband and I take alot of herbs and vitamins. I read the testimonals thought what can I lose. Focus has been a life-saver. The teacher says he's able to control himself better, listening and hasn't been sent to the office in over 1 month. If you do not want to put your children on medication you have to try this. It works 100% I will back this product. THANK YOU NATIVE REMEDIES "
"This is our second order and I am so glad that we are placing it. This product has made such a difference in our lives that I am almost brought to tears. Thank you doesn't seem enough." "I ordered your product for my 25 year old son with tourette's syndrome and add. he agreed to try the drops as directed... anything to slow down the tics and improve his focus and attention that didn't involve drugs that make him tired and depressed! After a few weeks on the product, he now attests to feeling more focused and tics have slowed. we will continue the trial and are so hopeful for continued improvement." "So far we have used one bottle on my 4 year old, results are amazing!!" "My 8 year old daughter was diagnosed with ADHD, I had two options, either put her on that strong medication doctors prescribe or look for another option, because of drug abuse in our famly history I thought it was best to try something natural, I found information on the web under native remedies and tried FOCUS. This has made a wonderful change in my daughter and my household as well. It has been very good for her, it helps her "focus", she looks more in peace, she'll finish whatever she has started, you can actually find her in the same place 1 or 2 hours after she has started soemthing. I am so glad I found this kind of medication and would recommend it to any worried parent as a way out for their children." "My grandson is in the first grade and since school started (August 26) he received nothing but black cards, the cards are best green, next yellow, next red, and worst black. The teacher could not get him to sit still to even know what she was talking about. I was at the end of my rope and I did not want to put him on prescription drugs. I heard about Focus, called the fine people and they explained to me about how Focus and BrightSpark work together. I received the order of both over the weekend and started giving him both. Monday when school started he got a green card, first time since school started, since then he has received only green and yellow cards. He is sitting still and doing his work so much better. He has not been on the medicine a month yet. Thank you so much for your help. I would recommend these products to anyone with children with ADHD problems. Again let me say thanks." "I have a 10 year old son who has had ADHD since the age of 6. He was prescribed Ritalin by the consultant. I thought it would be better for him if i get get him of the Ritalin as it had alot of side effects, ie, insomnia, nightmares, loss of appetite & highs & lows of ritalin wearing off. I was a bit sceptical about trying natural products, but after looking through the internet i came across FOCUS, living in the UK natural remedies for Adhd are not greatly advertised, so i thought i would give it a try. (He) has been on the drops for about 2 weeks now and his doseage for ritalin has been halved. He was also on sleeping tablets aswell. I have noticed a considerable change in his eating habits, he is of the sleeping tablets, and is alot calmer and is able to concentrate alot more at school. I would recommend this product to anyone who is looking to take there child of a prescribed drug given for ADHD. I have no hesitation in continuing ordering Focus and completely taking (him) of the Ritalin alltogether. Thank You." NOTE: Many experts believe that ADHD is not strictly speaking a disorder, but rather a group of symptoms which can be caused by many different factors, including emotional problems, inconsistent discipline, diet, hearing impairment, family problems, school environment and many other factors. It is therefore always important to correctly diagnose the problem, rather than resorting immediately to high schedule, sometimes addictive, psychiatric drugs with their unpleasant side effects. Ginkgo Biloba is an extremely effective herb used in traditional Chinese Medicine and derived from one of the oldest trees on earth. Recent studies have shown its ability to support memory making it one of the top selling herbal medicines in Europe! Active ingredients include flavone glycosides (including ginkgolide), bioflavins, sitosterol, lactones and anthocyanin. Scuttellaria Laterifolia (also known as Skullcap) has been traditionally used as an effective nerve tonic. It helps to support the mind and contributes to the maintenance of a healthy attitude and even keel. Active ingredients include flavonoids, tannins, bitter, volatile oil and minerals. Matricaria Recutita (also known as German Chamomile) was traditionally used to help relieve nervous tension, this herb helps to gently soothe and lessen frustration caused by overwork and fatigue. Active ingredients include volatile oil, flavonoids, valerianic acid, coumarins, tannins, salicylates and cyanogenic glycosides. Centella Asiatica (also known as Gotu Cola) is traditionally used as a tonic to support the healthy brain and nervous system. It is recommended to support brain functions such as mental clarity, healthy memory and to maintain a balanced mood. Centella asiatica is also a favorite food of elephants and, as we all know, elephants never forget! Recent studies have suggested that Centella asiatica supports cerebral blood flow (CBF) and circulation in general. Avina Sativa (Green Oats) a general tonic traditionally used in folk medicine as well as in modern herbalism, Avena sativa is invaluable in alleviating common nervous irritability. Active ingredients are saponins, flavonoids, minerals, alkaloids, steroidal compounds, Vitamins B1, B2, D, and E, carotene and wheat protein. Urtica Urens (called Umbabazane in Africa) is used both traditionally and in modern herbalism to support blood sugar levels. Urtica urens also helps the circulatory system. Active ingredients are histamine, formic acid, acetylcholine (important in maintaining healthy memory functioning), glucoquinones, minerals, Vitamins A, B and C and tannins. Aspalathus linearis (also known as Rooibos) is indigenous to the Cedarberg Mountains of Cape Town, South Africa and is not found anywhere else in the world! Rooibos contains magnesium, zinc and iron which all assist in maintaining a healthy nervous system. Zinc and iron, in particular, support balance in the brain, promoting consistency and healthy functioning of the nervous system. Safety during pregnancy or breastfeeding has not yet been established. Focus is best used in combination with a healthy diet, regular exercise and fresh air. While an immediate calming effect is usually noted, it takes a little longer for improvements in concentration, distractibility and memory to be noted. The best results are achieved when Focus is used consistently and the recommendations regarding diet and consistent discipline are followed. Be aware that lifestyle factors like diet, health and fitness levels will all play a part in concentration and overall cognitive functioning. While Focus ADHD is highly effective on its own, its effectiveness will be increased with regular exercise, sufficient sleep and a healthy, balanced diet. 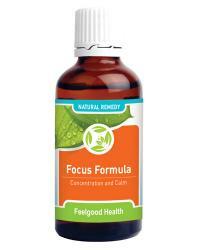 One bottle of Focus at full adult dosage (20 drops twice daily) will last 25-30 days. For children under the age of 15 one bottle will last longer as less drops are taken. A bottle of Focus for a 10 year old child, for example, would last around 50 days. For chronic ADHD symptoms (with hyperactivity) including anger and behavioural issues. Support healthy concentration and attention, a pleasant attitude and normal energy levels in children.